Club Penguin Cheats by Mimo777 Club Penguin Cheats by Mimo777: Club Penguin Party Update: The Fair! How has the Club Penguin Fair been going so far!? Good? Great? FANTASTIC!? 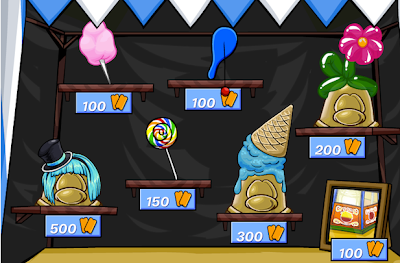 Awesome, CP has put out all new prizes in both Prize Booths. So be sure you check 'em out! What is your favorite prize in the booth!? I was hoping they would make a different flavor ice cream hat. Last year the ice cream hat was blueberry & the girl hair was pink. This year the girl hair is blue, so why isn't the ice cream chocolate or something? Oh well, it's a pretty good party anyway. I hope there's a new Halloween or Autumn igloo in the next catalog. A night scene would be good too, so my camp could be at bedtime but I don't know if they could make that happen. Um, none! There's not a single new item! Yeah, the re-coloured wig doesn't count! They promised all-new items! Well, I wouldn't all new. The only thing that was never there before is the same wig and and hat, but in blue exept of pink. I'm pretty disappointed by the non-member prizes this year. Hey Mimo777, not sure if you know this but at the lighthouse telescope you can see a small red dot. I assume it's rockhopper. MIMO! check the telescope in clubpenguin there is a red light kind of thing. All these items are old except that blue girl hair. I worked hard for the lollipop item (1,000 tickets) a few years ago. I was also hoping more some new items and not just color differences. I'm very disappointed.